Welcome to the Marshall-Laybourn Cottage! 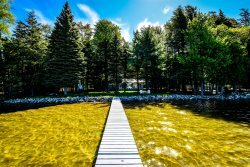 This home is nestled in a cove on the South Shore of Crystal Lake, near the west end of Mullineaux Rd. You can accommodate up to 10 people so it is perfect for hosting a larger family. Yet a family of 8 may be a bit more comfortable with the sleeping arrangements. The spacious open floor plan of the main level allows for everyone to be together. Extra space for relaxing on the enclosed porch, open the windows that align the room and let the breeze flow! Open the sliding doors between the living area and porch to cool off the entire house. At the backside of the home is the spacious master bedroom that opens to its private screened in porch. The main floor bathroom is also near the back door. Not quite handicap accessible, it has a shower stall, high rise toilet, and stacked HE washer and dryer. At the top of the stairs, you will find the loft with two twin beds overlooking the living room. To the backside of the loft area are the other two bedrooms, one with a full bed and one with two twins. The bathroom with shower stall is conveniently located between the bedrooms. Enjoy your time outside on the deck that wraps around nearly the entire cottage! You’ll find a gas grill outside the back door and seating for a delicious meal on the front of the deck. Adirondack chairs line a part of the deck facing the lake. Perfect for relaxing while looking out on the amazing view. To the far side of the cottage, you will find a private outdoor shower, ideal for rinsing off after a day in the water. Interested in booking a vacation for the whole family??? Rent nearby Crystal Clear (141), too, and accommodate up to 20 people! While on vacation take advantage of all that is Northern Michigan. Enjoy local restaurants, sights, and shopping. For a few more pictures and information, please visit the Marshall-Laybourn Cottage website. Danielle was very helpful and friendly. Amazing place for a good old fashioned family summer vacation. This was a beautiful lake property and our family had a great time!